Whether it’s a front stoop stacked with flower pots or an elegant apartment building with boxwood planters, we all want a home with curb appeal. But Brooklyn residents must deal with the inconvenient reality of garbage storage amidst limited outdoor space, and trash spilling over from unsightly containers can ruin the first impression of your home. Luckily, there are a variety of ways to conceal your trash cans, some with the added bonus of obstructing rats. 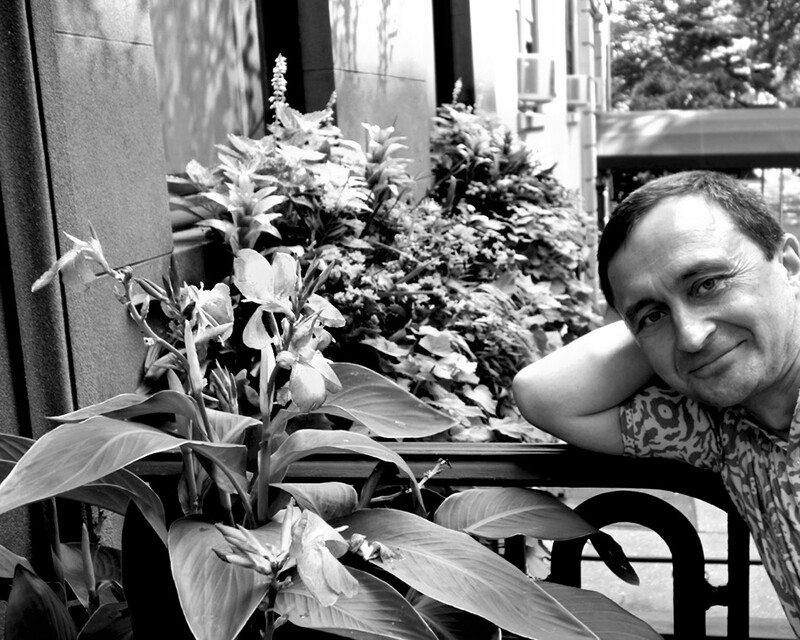 Brooklyn Heights gardener Serhiy Mshanetskiy has created a “live hanging wall curtain” to disguise trash cans behind a lush green veil of vines. At the Brooklyn Heights Designer Showhouse, ivy and vinca vine spill over from three tiers of flower boxes that Mshanetskiy built over an existing garbage bin. The boxes are also filled with evergreens, white begonia, cyclamen, peace lilies and other flowers. 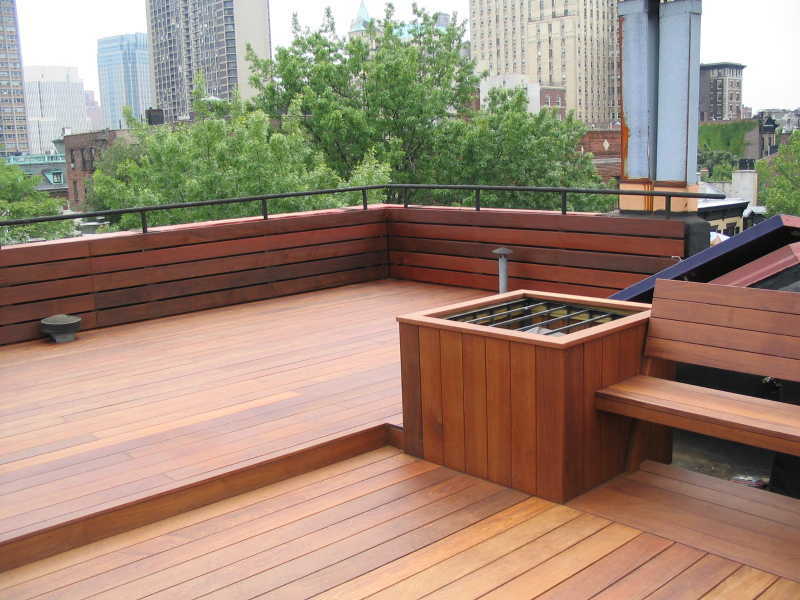 The planters are built of treated wood and lined with water resistant fabric, and drainage holes direct water to an existing pipe. The live curtain conceals the trash cans almost entirely, though won’t solve your rat problem. Mshanetskiy declined to put a price on the live curtains, saying he charges by the hour and the cost varies widely depending on the size of the boxes. CitiBin, a modular trash enclosure made from aluminum and a recycled bamboo composite, seem to be popping up everywhere in Brooklyn. Liz Picarazzi, the founder of CitiBin, said she has spent the last several years perfecting her garbage bins, after combing the borough for different types of trash enclosures and photographing them as research. The bins come in two different sizes, one for standard 44-gallon round cans and one for larger wheeled cans. The bins also come with the option for a built-in planter to the top. A standard two-module bin starts at $2,850, plus $250 to $450 for installation. The bins come in three different colors and have stainless steel hinges and hydraulic arms on the top hatch for slow closing. The bins are made to endure harsh weather and require very little maintenance. And they are rat proof, Picarazzi said. 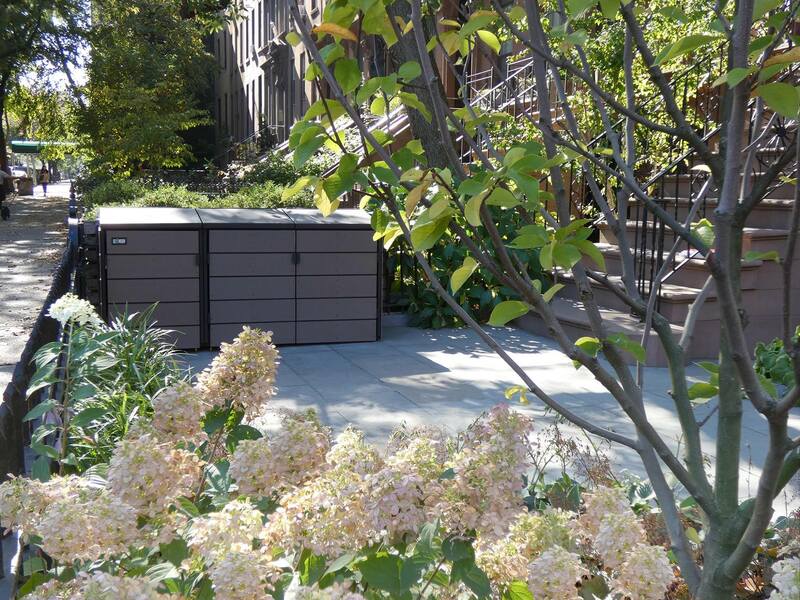 For a different look, Metrobox, based in Sunset Park, makes trash enclosures from rust-proof aluminum powder-coated in black. Julio Lio, one of the owners, said he designed the bins after a search for an attractive way to store trash at a rental property he owns in Brooklyn Heights came up empty. 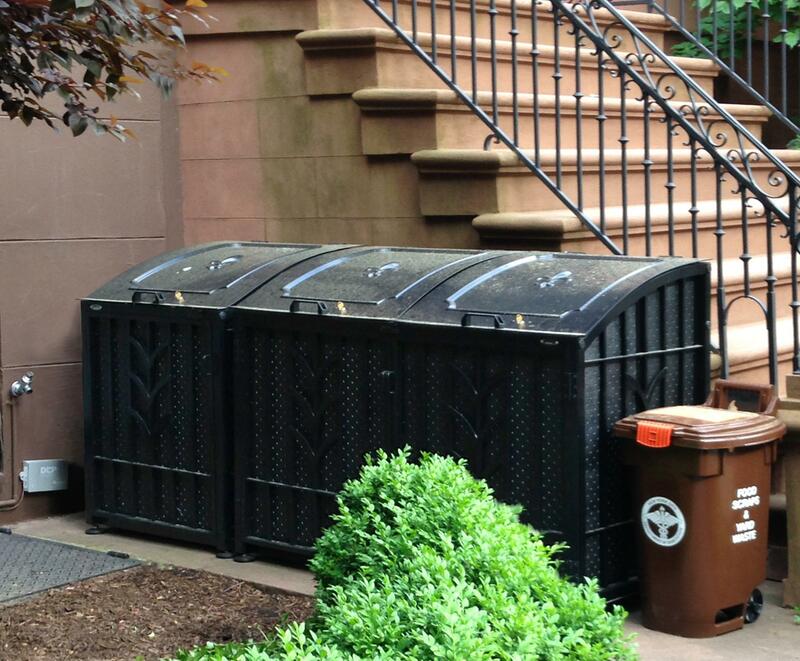 The bins are sized to fit the front yard of a brownstone and to be moved if they are placed over a hatch, Lio said. Each Metrobox is lined with vinyl and has an aluminum floor plate. They hold two 32-gallon trash cans and come fully assembled at $1,000 per bin. Some carpenters or woodworkers will build enclosures from solid wood for a fully customizable option that is slightly more expensive. Rayboy builds his bins out of knotty cedar because it’s inexpensive and easy to work with, he said. His bins have doors on the front and top and are open on the bottom. The price is about $2,000 to $3,000 for labor and materials, he said. And because they’re made of real wood, they require some maintenance. The bins must be touched up with a sealer every few years.